The film composer Friedrich Hollaender grew up in a musical family. 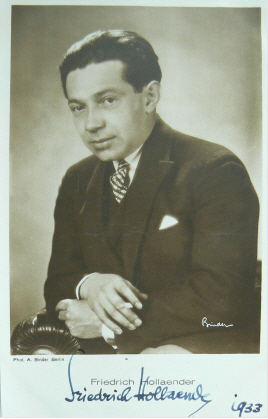 His father Victor Hollaender was a successful operetta composer who wrote music for different shows in Berlin and his mother was the singer Rosa Perl. Therefore Friedrich Hollaender already got music lessons at a young age and he studied among othersby the composer Engelbert Humberdinck. Finally he followed his father's footsteps and he became a successful composer of numerous shows in Berlin during the 20s. Moreover he founded together with Mischa Spolianksy, Blandine Ebinger, Kurt Tucholsky and other artists the cabaret "Schall & Rauch". Other stage activities came into being for the cabaret "Die Wilde Bühne" by Trude Hesterberg and he also founded the "Tingel-Tangel-Theater". In 1920 he already wrote his first composition for the silent movie "Sumurun" (20), it followed a second one for the silent movie "Kreuzzug des Weibes" (26). With the rise of the sound film the film business offered him new possibilities to establish his musical talent and he soon became a demanded film composer in Germany. In the next years he wrote the filmmusic for productions like "Der Andere" (30) and the classic "Der blaue Engel" (30) with Emil Jannings and a young Marlene Dietrich who became a world star afterwards. For this movie he composed the world wide hit "Ich bin von Kopf bis Fuss auf Liebe eingestellt". Afterwards followed "Einbrecher" (30), "Der Weg nach Rio" (31), "Der Mann, der seinen Mörder sucht" (31), "Das gelbe Haus des King-Fu" (31) and "Stürme der Leidenschaft" (32). Friedrich Hollaender had brief appearances in the movies "Der blaue Engel" (30) und "Der Mann, der seinen Mörder sucht" (31). And in 1933he even realised the movie "Ich und die Kaiserin" (33) as a director. But his ambitous career came to a premature end with the rise of the National Socialist because he was a Jew. He emigrated via France and England to the USA where he was able to continue his film career in Hollywood. Because music is an international language he was not confronted with the linguistic barriers like many emigranted actors in order to continue to work. He even realised two more movies there as a director. He soon became one of the great film composers in Hollywood and he wrote filmsongs and soundtracks to many well-known productions. To his most popular movies of the 30s and 40s belong "The Only Girl" (34), "Shanghai" (35), "Anything Goes" (36), "Desire" (36), "Champagne Waltz" (37), "Angel" (37), "True Confession" (37), "Bluebeard's Eighth Wife" (38), "Man About Town" (39), "Destry Rides Again" (39), "Typhoon" (40), "The Great McGinty" (40), "Million Dollar Baby" (41), "Manpower" (41), "Once Upon a Time" (44), "Conflict" (45), "Cinderela Jones" (46), "The Verdict" (46), "Berlin Express" (48), "A Foreign Affair" (48) and "A Dangerous Profession" (49). In those years Friedrich Hollaender was nominated for three Oscars but never received one. In the 50s came his last filmcompositions for the American film market into being. To these works belong "Born to Be Bad" (50), "Born Yesterday" (50), "The First Time" (52) and "We're No Angels" (55). For "The 5'000 Fiungers of Dr. T." (53) he got his fourth Oscar nomination. Finally he returned to Germany where he revived his former activities at the cabaret and it followed also few more filmcompositons. To his last cinematical works belong "Der grosse Dreh" (58), "Das Spukschloss im Spessart" (60), "Chansons mit Geschichte" (63) and "Das Blaue vom Himmel" (64). After his film career Friedrich Hollaender wrote several books, among them his biography "Von Kopf bis Fuss" (65). Friedrich Hollaender was among others married with the actress Blandine Ebinger.